patient is euvolaemic – i.e., not dehydrated or fluid overloaded. Bag 3: 5% dextrose then back to Bag 1. Bag 3: 0.18% NaCl + 4% dextrose then back to Bag 1. Tiny, old and frail person: 84 mL/h (or “q12h”) – though you shouldn’t be writing fluids on “autopilot” for the tiny, old and fail person. You are hereby warned that imprudent use of “autopilot” therapy with intravenous fluids can (though rarely) harm your patients. What is in a bag of fluid? As you can see, if you use the “autopilot” IV fluid regimens, they give pretty close to what we need. … which is why the “autopilot” regimens work. Most people eventually work this out through trial and error, but knowing what you’re actually doing is probably preferrable. This is a great explanation of fluid calculation. I think I finally get it! Thanks. I am a 4th year medical student got the article very interesting. I am interested to know what history,physical examination & investigation is important in evaluating true oliguria and success of treatment. What are the alarming sign in the management of postoperative oliguria. I wrote a brief article on the management of post-operative oliguria here. History: thirst, last micturition, history of significant fluid loss, length of operation, ? bowel operation. Physical examination: observations (? tachycardia, ? blood pressure, measured urine output), tissue perfusion (capillary return), tissue turgor, mucous membranes, JVP, abdominal examination – specifically palpation for a full bladder. Alarming signs are basically if the patient is going into shock: high tachycardia, low blood pressure, poor perfusion, etc. Thank you for your valuable comments Barb. Best wishes for your grand-daughter and I hope that she is able to go home in good health soon. I do not necessarily agree with some of your comments and I wrote an article on some of the issues that your comments raise. Is the actual “bag” the IVF come in permeable?? I mean, are you able to actually write on the bag itself with a permanent marker or should you write on silk tape with the marker and place it on the bag. Thanks for your question Kristie. I do not know this to be a fact, but my guess is that the plastic the “bag” is made of would almost certainly be impermeable to the common solvents used in a marker pen. However, this is perhaps the wrong question. If you are asking whether you should write on the bag itself, the answer is “no”. This is simply for the sake of clarity in a clinical situation. Any instructions or additives to the bag of fluid written on the bag itself can be easily missed. In the hospitals I have worked, it is common protocol to write all additives on a separate highly visible fluorescent coloured sticker that is then adhered to the bag of fluid. Where this is not available, then writing onto white tape and adhering that onto the bag is not an unreasonable solution. In an emergency situation, I have used tape to directly attach the used ampoules of the additives to the outside of the bag of fluid. thanks for a quick reply. Just for clarification purposes, we do place adhesive bright orange stickers on the bag of IVF when we have additional additives. The reason we are wanting to write on the bag is to label the bags #1, #2, #3, etc. to keep track of how much total IV fluid the patient receives while in our outpatient services. We do outpatient procedures (colonoscopies, endoscopies, bronchoscopies, etc.) and for JCAHO purposes we have to be able to identify how much IVF the patient receives while in our care. We are going to label the bags so the last nurse (the recovery nurse) that takes care of the patient can easily see how many bags of IVF the patient has had and calculate it like that. With a different nurse using a different form for his/her documentaion purposes, it is too haphazard and time-consuming to flip through each paper in the chart to see when each nurse hangs a bag of IVF. Thanks again………By the way, upon waiting for your reply, I contacted a Baxter sales rep. and was informed that the actual bag is slightly porous and could possibly be permeable and he recommended using the silk tape to apply the info. I was wondering about what I should do with patients with liver failure… I know they and cardiac failure patients are not supposed to receive normal saline as it moves to extravascular space… but could you explain why? And how do I replace their sodium? I would recommend reading a good physiology and pathology textbook, but from memory, in chronic hepatic dysfunction there is relatively excess of steroid based hormones as they are normally metabolised in the liver. For example, excess oestrogen results in gynaecomastia. As such, there is mineralocorticoid (e.g., aldosterone) excess resulting in the retention of sodium in the distal tube of the nephron. Water follows the sodium ion, so patients with chronic hepatic dysfunction retain both water and sodium. Reduced synthesis of albumin leads to a reduction in oncotic pressure, subsequently leading to fluid being lost to the extravascular space, particularly, the interstium (i.e., oedema and ascities). This is why diuretics like spironolactone (an aldosterone receptor antagonist) is particularly helpful in liver failure. A patient with chronic hepatic failure would therefore likely have an excess of total body sodium, even if it isn’t necessarily reflected in their serum levels and giving saline rich fluids will worsen their fluid retention. There isn’t really enough information in your question for me to answer that. 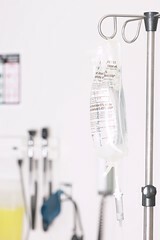 Intravenous fluids are only required if the patient is unable to take fluids orally and there can be many reasons why that may be the case (e.g., vomiting or awaiting surgery). do you subscribe to the Stewart SID theory that NS is an acidotic fluid due to the chloride content? Given that I have seen hyperchloraemic acidosis in ICU that was probably in part due to large quantities of NS the answer would be yes. However, I also don’t think that it makes much (or any) difference in the typical usage of NS. I personally prefer NS to Hartmann’s solution as it is always available, its easier to calculate electrolyte content, and there is no problem with using blood products in the same line. I am in the hospital now. I have been here for about 48 hours. They put on a saline drip when I came in and I went through at least 8 bags up through tonight. I developed a bad headache tonight and was urinating a ton about every ten minutes. I asked them to take the IV out and they did and now three hours later I feel much better. Could I have been over-saturated? I have also been driking water the whole time as well. In backround, I came in after having a episode of shaking and getting really cold with a bunch of other symptoms. They thought I had endocarditis but the cultures have not grown anything and the echo results looked ok. Should I ask them to check potassium and electrolytes? Could I have just gotten overhydrated tonight? In the absence of any further information, I cannot confidentally tell you one way or another, but your history and symptoms do sound consistent with overhydration. With regards to checking your serum electrolytes, it is probably not necessary. As long as you are eating and drinking and there is no reason to suspect that you have kidney dysfunction, your kidneys will return your water and electrolyte balance back to homeostasis. In any case, if you have any questions about your management, don’t hesistate to discuss it with your treating physician. Best regards and I hope everything turns out well for you. Great article. I went to a tutorial that covered most of what you’ve written when I was in fifth year medical school (a little while ago) and I still have the notes carefully preserved. Apart from that one lecture which many students didn’t get, I would have graduated with absolutely no idea about the practical aspects of prescribing IV fluids. Interestingly, med students still don’t seem to get taught this properly…they get taught it, but not in any practical sense. If you explain how to calculate water volumes, sodium requirements and potassium requirements – and then give them a ‘standard’ regimen – suddenly everything makes sense. Lightbulbs switch on in their brains, and suddenly all is well in the world. Echoing Barb’s comments above, I think this is important to get right. I had my daughter in the ED a few months back in a major tertiary teaching hospital. It was 3am in the morning, she was 5%+ dehydrated and not passing urine. The ED resident wrote her up for IV fluids and because the potassium looked like way too much (particularly in an oliguric patient) I started doing some rough calculations. When queried on what method of calculating potassium he’d used, the resident bluffed a bit, and then stated ‘The registrar told me to put in ‘shitloads’ of potassium, so that’s what I did!’. So good work Michael. This is the best, most understandable article on the subject that I’ve seen. Thanks for your kind comments Rob! Hiya, I’m a 3rd year medical student and I’m about to do my 3rd year clinical osces in a couple of days and I know fluid balance will def come up but we hadn’t really been taught it so I’m so glad I found this! How many days of IVT before Ca, PO4 and Mg supplements should be considered? Thanks. And what are the daily requirements + example regimens? It’s difficult to find practical info on this topic. Much appreciated. There is set answer to this question. It would depend very much on losses and serum levels electrolytes. I am so glad i stumbled this website. I couldnt add it to my desktop shortcut quick enough . I am a first year nursing student and find the information you provide valuable in an easy to understand way. I have a question.Can you pls tell me from when(age)we can change the maintenance fluid from 0.45%NaCl to 0.2% NaCl ? Michael, it seems that most of my patients are obese, with weights well into the 100s. Is maintenance fluid based on actual, or ideal body mass? Should I really be charting my 140kg patient with 5L of fluid for maintenance? I have seen this mentioned before. Presumably, some of the solvents in a permanent marker could conceivably be absorbed into the plastic of a bag of fluids. In any case, it is good practice that information is on a bag of fluids be prominently displayed and this would be best done by writing an a fluorescent adhesive sticker. Hi… I’m a Final year medical student… This articel was waaaay easier to understand than all those complicated notes we use in med school. Could you PLEASE show us hot to calculate perioperative/post operative fluid losses with on going losses?… thanks ..
Could IV fluid overload given with a severed ureter and a crimped ureter for 30 hours cause diastolic dysfunction with secondary mild pulmonary hypertension? Sorry, I didn’t have a ureter removed, I had stent removal of that ureter. I interpreted your initial query as whether the IV fluid overload could cause acute heart failure. It is unlikely those events would lead to any continuing cardiac dysfunction. Man… I’m just checking this at fly…gonna go to bed now. But this is GREAT, I’v been looking for this in papers, books, but I cannot find it. Now I will finaly understand this topic. hey, nice site, I have to say though I prefer Hartmann;s/CSL to N Saline because of the excess sodium load that Saline results in, particularly in patients who have significant activation of their Renin-Angiotensin-Aldosterone System who tend to retain Sodium. Also, the GIFTASUP guidelines suggest replacing N Saline with CSL for most purposes. i dont understand how a fluid like normal saline which has a neutral pH could cause hyperchloremic acidosis if transfused in large quantities. could u please tell me why? Hi Michael, great info btw! What is the maximum infusion rate for maintenance fluids in adults? Considering the UK guidelines 2011, would you change the choice of fluids (let’s say 0.9 NS to Hartmann’s) when infusing maintenance levels in a “normal” person 70 kg? My other question: Would you change 0.9 NS to Hartmann’s or Ringer Lactate when RESUSCITATING a patient? thanks lot. its v.easy and clear. The use of saline rich intravenous solutions in the paediatric population is now uncontroversial and is definitely best practice. It is important to recognise, however, that it is uncommon for children who are well and euvolaemic to require IV fluids in the first place. This is not the case in adults (e.g., those waiting for elective surgery). We do need to be careful in giving inappropriately high amounts of sodium and water – iatrogenic pulmonary oedema is not uncommonly seen in hospitals! Have been using the 4:2:1 rule for some time but wondering whether there are any formulas for calculating more specific daily maintenance fluid requirements which take into account: age, weight and gender – particularly when we know percentage water in the human for adult is 70% whereas water percentage for the frail elderly is 50%? Also note that you recommend 40mL/hr whereas 50 kg female 20mL/hr.